Archiver Menu is a Firefox add-on that allows you to make a copy of a web page on archiving sites, and to retrieve a cached copy of it. Update: The extension is known as Page Cache Archiver - Get Cache & Save Page now. There are situations where you may want to keep a copy of an article or web page. Maybe for local access, legal reasons, reference, documentation, or fear that it may be taken down. While you can always save any web page to the local device using the browser's save functionality, you may sometimes prefer an online copy of it instead. Online copies have the advantage that they are accessible from anywhere, and that they usually keep records of date and time when a page was saved. Tip: Read preserve web pages with the Wayback Machine for instructions on how to do so manually. Archiver Menu is a Firefox add-on that lets you do that. All that is required is to right-click anywhere on the page that you want to archive, select the Archiver Menu option from the browser's context menu, and then one of the supported services. The archiving services that the extension supports at the time of the review are Archive.is, Archive.org, Webcite, and Megalodon. You can select any one of them, or all of them. The last option is useful, as you create multiple copies of the page on mirror sites. 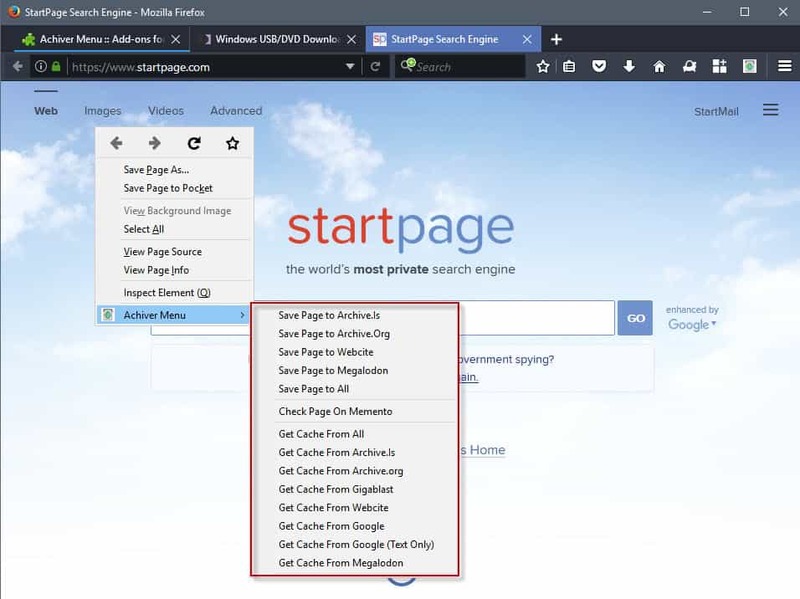 Some services save the page automatically when you select them, others may require you to click on a button or do something before the page gets saved. The extension keeps no record of the pages that you have saved to one or all of the archiving services. You need to use another means of saving the information, for instance by bookmarking the archived pages. You can save the page directly to one of the services with a click on the toolbar button of the extension. The default is set to archive.is. The second big feature of Archiver Menu for Firefox is called get cache. It enables you to get cached copies of the page you are on from supported services. The two archive sites are supported there, and so are Google, Webcite, Gigablast, and Megalodon. You can select any one of the services, or open them all at once as well. You may want to open the options of the extension before you start using it, as you may use the settings provided to change the default toolbar button action, and make other modifications that are relevant. Force use of HTTPS for services (with exception of Webcitation and MementoWeb). Set the default toolbar button action. Add an email address that is required by the Webcite service. Select if you want to open the archive page in a new tab, and switch to it automatically. Set context menu link options. Configure logging to the console. Archive pages using web services. Archiver Menu makes the process of archiving websites and retrieving cached copies more comfortable. While the extension does nothing that you cannot do manually, it may speed things up significantly for you if you make use of archiving or caching services regularly. The extension lacks a history feature however which the developer should consider adding to the add-on for greater control over the archived pages. Local Storage inspector from https://potch.me/ls/ can be dragged to your Bookmark Bar. it's too long to paste here. Of course, what it should also do is offer a quick and convenient way to a) bookmark the page (bookmark manager ! ), b) save it as a file locally. Thus we could have, within a single tool, the three main ways to save a web page in a close to native state. The lack of such a tool is the reason why I use Cinta Notes, which has its own problems ; the main ones being its big limitations in import/export capabilities, and the fact that it’s a one-and-a-half man operation, therefore it could disappear tomorrow morning. You are supposed to be able to save to pdf (on the archiving sites ? ), but I can’t see how that happens. The developer can’t even get the name of his own add-on right. It’s obviously meant to be called Archiver Menu, as stated here. However, on Mozilla’s site, the developer calls it Achiver Menu — a probable mistake. It’s fortunate for him that Mozilla’s search engine picks up his “Achiver” when one searches for “Archive”. We’ve reached a stage where even software developers, who, by trade, know that a single mistake in one character can break their work, don’t seem to care anymore what letters exactly they put in their words — as long as they are dealing only with a human language, and not with machines talking to each other. Illiteracy is growing fast. Archiving pages is as easy as bookmarking them and there are extensive features for organizing Once saved, no internet connection is required for viewing. A Scrapbook menu appears alongside the bookmark menu, so the whole experience is seamless and effortless. All other options pale in comparison. Do you have an idea whether ScrapBook X (or its variants) will survive November’s add-on apocalypse ? Right now it is not compliant. I have installed ScrapBook (the original) long ago, but never used it, fearing a non-standard, closed system. A cursory glance at the support pages hints at an impressive program indeed, but should one commit precious data to a potentially obsolete format ? Two questions here : will ScrapBook (X, Plus, whatever) be turned into a Web Extension, and barring that, will files generated by ScrapBook be able to be opened by other, standard tools in an easy way ? ScrapBook X is a powerful addon with quite a few advanced features, so it is unlikely to be ported to WebExtensions any time soon. I use it with Pale Moon, not Firefox, so Mozilla abandoning all non-WebExtension addons by year’s end does not affect me. Saving to .mht/mhtml is another solution. Yes, that’s what I do. In fact, I first try to save in htm : this is very light, and keeps all useful elements of the page most of the time. When this does not work, I used to save in maff (but I doubt this will survive WebExtensions), and now use mht instead. However, you’re then stuck with Windows Explorer, which does a very poor job of searching. Windows “search” is a joke, whether in file names or in content. And it doesn’t have search through tags, which is absolutely needed to complement a folder and subfolder filing system, as soon as you start to seriously accumulate data. That’s one more reason I use Cinta Notes, which saves everything in a single database, and has blazingly fast search — including a tag system. It also preserves links and rich text when clipping from a webpage, which makes it a very interesting solution if your work is text-oriented. It does not save images though, that’s one limitation you must be aware of (although you can save links to images). So you won’t “see” your saved Web page with it, only rich text with hyperlinks, and whatever notes you’ve appended to it : free-text remarks, plus date, title, URL, tags, categories, and file attachments if you need them. Thanks for the very timely suggestion. I need something to replace the Mozilla Archive Format add-on if it goes away with FF57. Hi, since the version 1.9 you can save locally the webpages and there a lot of more options added since the first version.